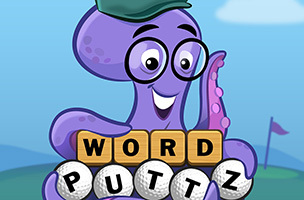 You Don’t Know Jack developer Jackbox Games has announced the launch of Word Puttz on mobile, combining word games with a miniature golf course. In each level, the game challenges players to create words to form a path the golf ball can take to the hole, earning points related to the quality of their words. In each stage, players are given a starting letter, and must build words horizontally and vertically until one letter overlaps the hole. Letter tiles are offered in small groups, as in a game of Scrabble, and players are allowed to create words and then delete them from the board if they get stuck. As players progress, the path to the hole may become longer, and obstacles will appear on the green. Gamers earn up to three stars on each level, and must earn a set number of stars to unlock additional stages (or unlock them via in-app purchase). Power-ups are also available to purchase, like word hints and additional lives, as well as ad removal and other permanent unlocks. Word Puttz comes with four courses and more than 70 levels at launch, but Jackbox plans to add additional courses in the future. Word Puttz is available to download for free on iOS, Google Play and the Amazon App Store. Check back soon to follow the game on AppData, our tracking platform for mobile and social apps and developers.